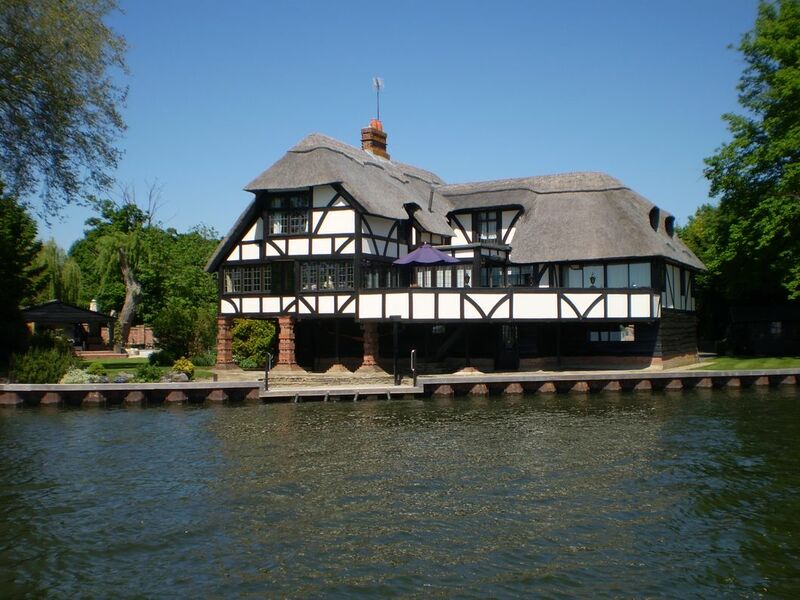 Gentle stroll to village shop to buy the Saturday papers before departing downstream of Goring bridge; just 65 miles north of Teddington lock and the tidal Thames. 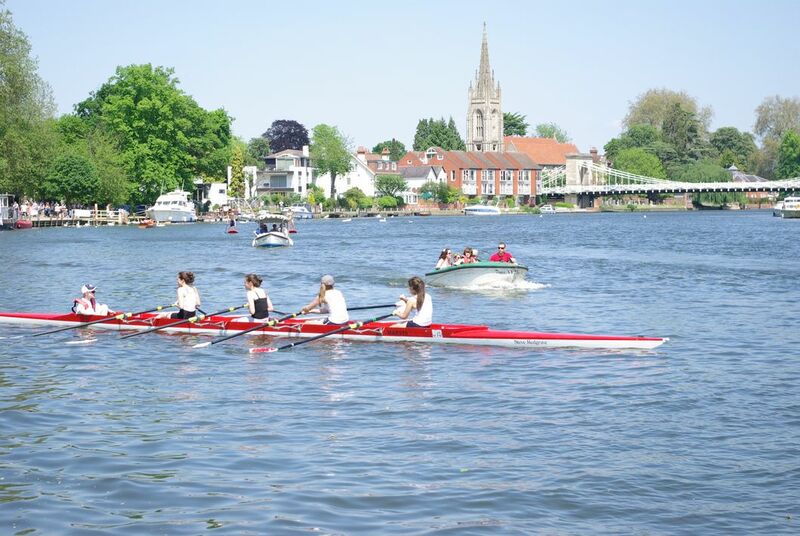 Sun shining all the way today although a little breezy at times which seemed to be more of a problem to the Saturday rowers than us. 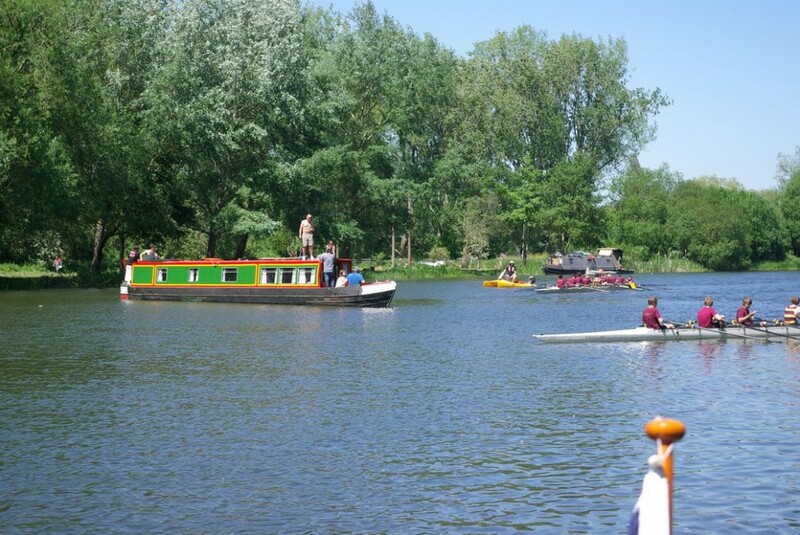 Passed Beale Park, well known as site of previous annual Inland Waterways Association festivals. 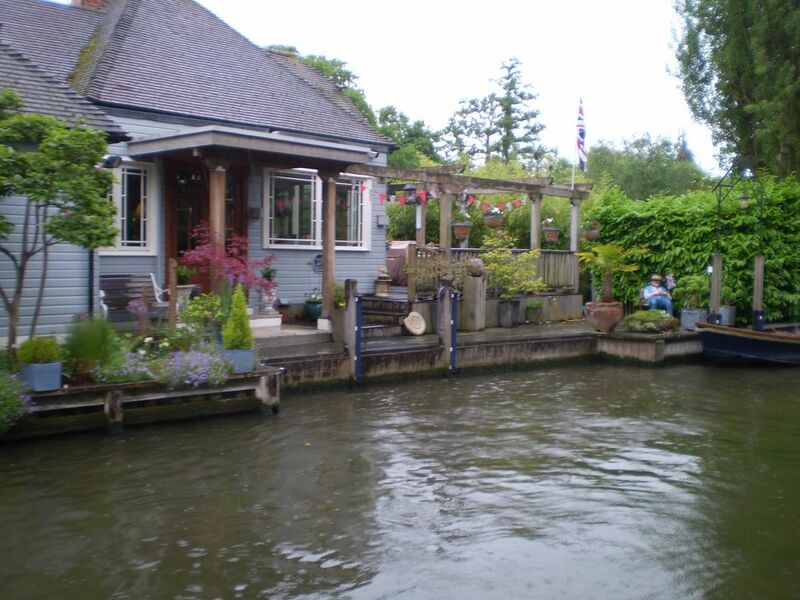 We have camped on this site and also been guests of the Dutch Barge Association and our very good friends, Diana and Chris on Esme. 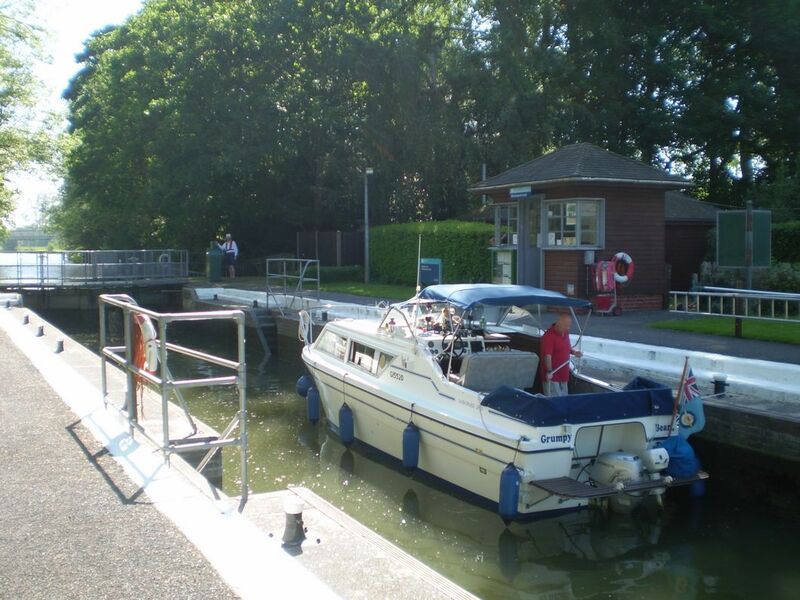 First lock of the day Whitchurch with helpful & friendly lock-keeper, as they all are on the Thames! 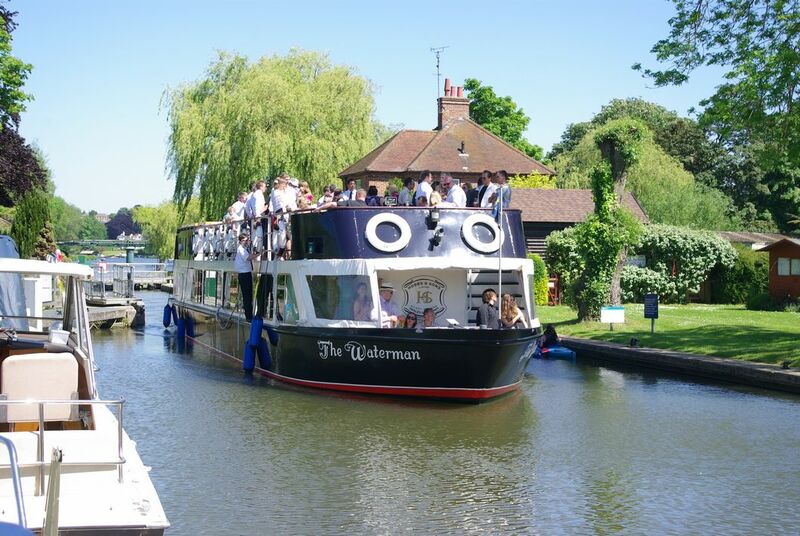 Then cruising on down by Pangbourne meadow to Mapledurham lock (sadly no time for bacon butties this morning, maybe on the return journey) and Caversham lock. Quick pit stop at Better Boating Co for replacement gas bottle and water; followed by Tesco Reading for some groceries. Setting off again the River Kennet, entrance to the Kennet and Avon canal, branches, into the Thames at this point; just before arriving at Sonning lock we stopped for lunch. This meant we could watch the antics of the schoolboy rowers made all the more chaotic by a hired narrowboat breaking down midstream. 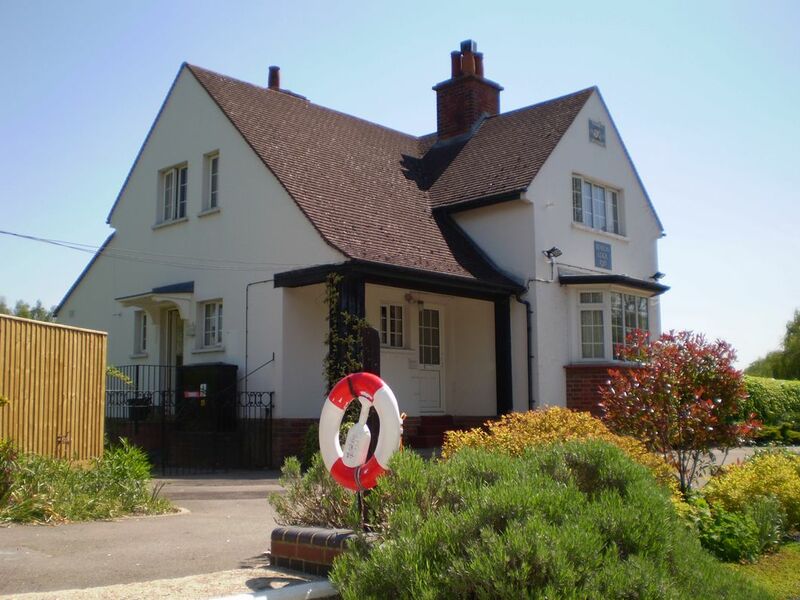 Admiring all the lovely waterside properties – this one we’ll buy when we win the lottery! After lunch we seem to hit the Saturday afternoon traffic & had an interesting time queuing at Marsh lock above Henley in some gusty wind. Finally moored in Henley for a well-earned Pimms at 5pm. I must say the harbour master has some pretty sharp eyes, as it was not long before he was alongside in his little launch to collect the £8 overnight mooring fee. But, since we were in such a great spot we smiled as we paid. 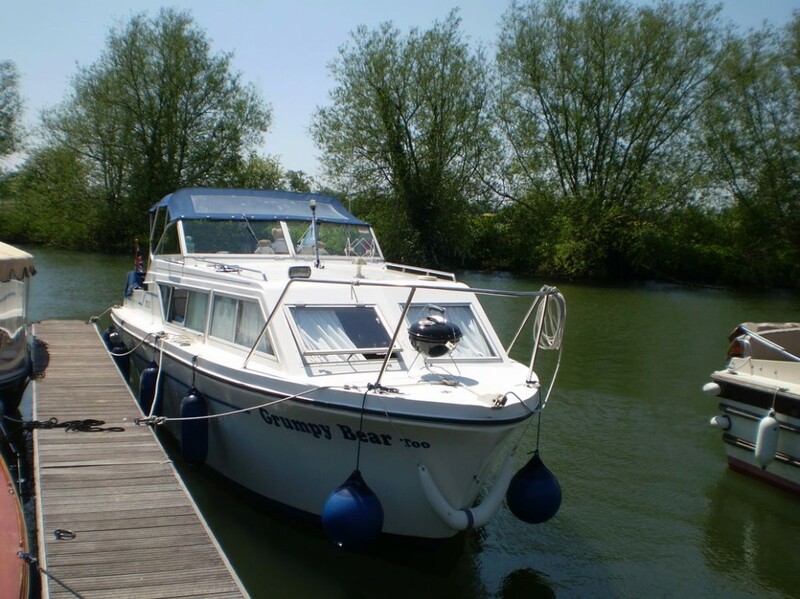 Gosh it’s hard work being on holiday and keeping a blog – enjoying ourselves too much in the sunshine yesterday to post, today also very hot so on board now out of the sun at 5pm to update everyone. 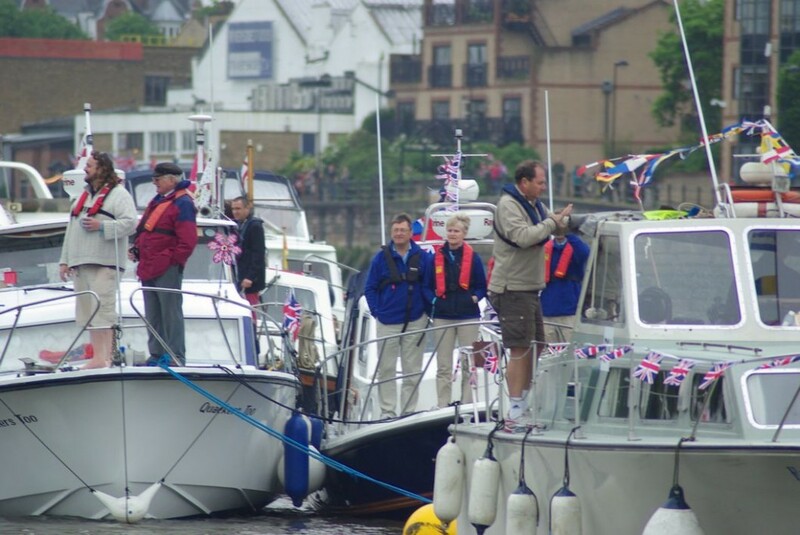 via Hambleden, Hurley and Temple locks; spotting other Pageant boats en route downstream towards Teddington and the Diamond Jubilee flotilla – Omega, Siku Kuu and Hestia who like us will be part of the recreational motor boats squadron, plus Sudersee, Neeltje and Libertijn of Alphen who will be amongst the barges. 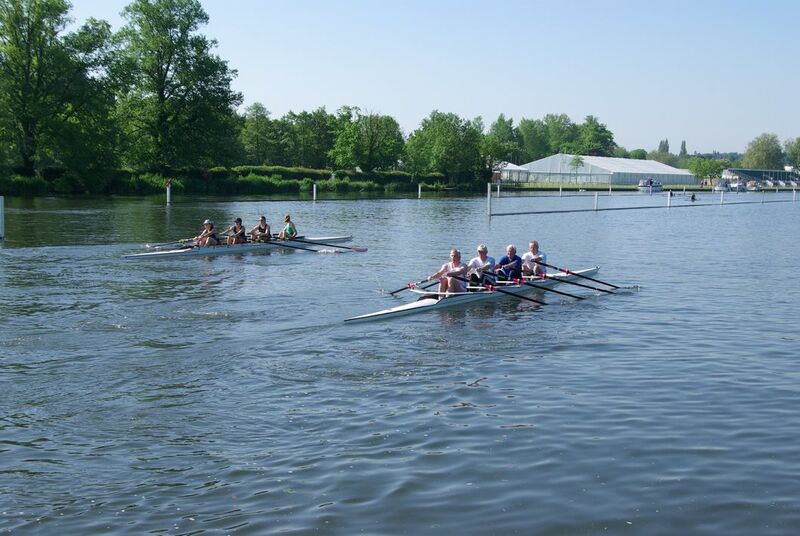 We came past Longridge Scout campsite upstream from Marlow where they were practising in a dragon boat (maybe they will be performing for the queen next Sunday too?). Mike remembers camping at Longridge and our son, Paul, has camped there when he was a Scout too. 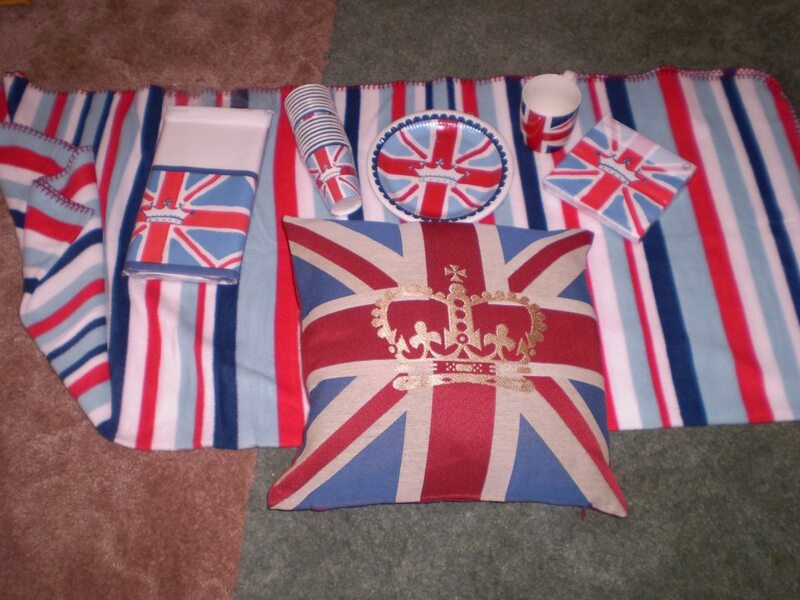 Marlow was our lunch stop destination & shopping purchases included a Union Jack cake tin plus set of 4 ‘cool britannia’ cork placemats and free CD with ‘Mail on Sunday’ a Diamond Jubilee tribute – Elgar’s Pomp and Circumstance Marches and Parry’s Jerusalem just to mention two tracks. 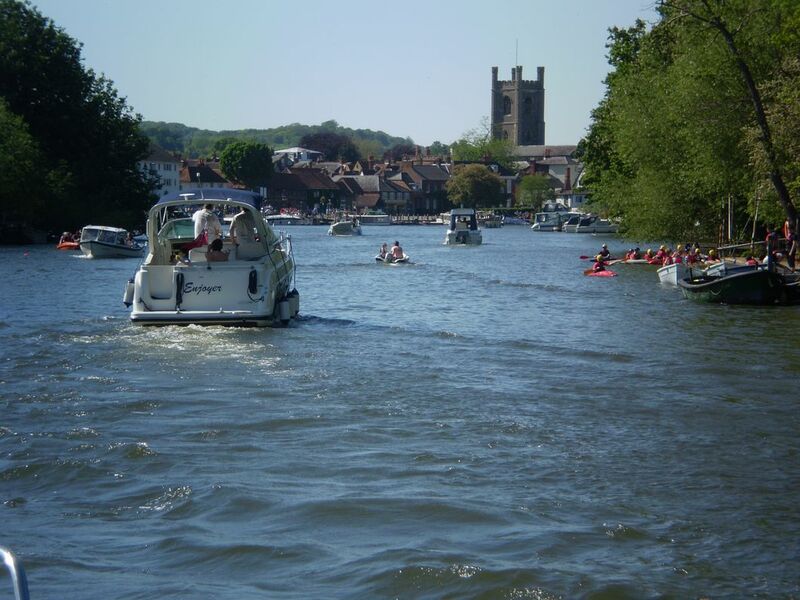 then negotiated our way through dinghies racing from Upper Thames and Cookham Reach sailing clubs before mooring on Marsh Meadow above Cookham for a bbq. We strolled into the very quaint english village which comprises rather expensive dress shops and restaurants but no little corner shops. So no newspaper today as not even the garage sells them. 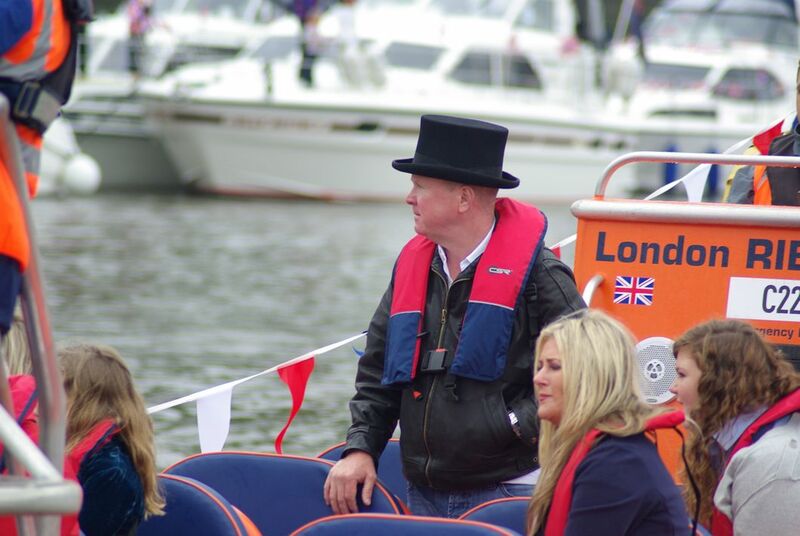 So back to the boat where we were met by the friendly warden collecting the £5 mooring dues whilst walking his dog. 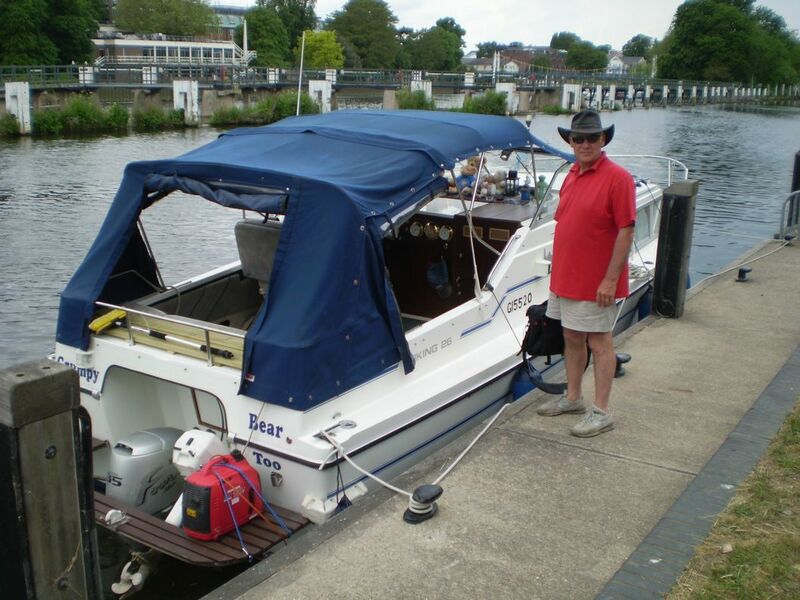 Today we have navigated through Maidenhead and Bray to Windsor marina and topped up the new fuel tank with petrol, then onto Eton and Windsor where we are moored on the outside of Baths Island. Windsor Castle and the Windsor Eye are on the south side of the river and Eton college is on the opposite bank. We took a walk into Eton across the main Eton/Windsor bridge and towards Eton College. Lots of smart boys in their uniform of full winged collars and bow ties, even in this heat. Shame to see that the Union Flags in the High Street outside the St Christopher Hotel and the pub opposite were all upside down. That does seem typical these days but a great shame in this Jubilee year. 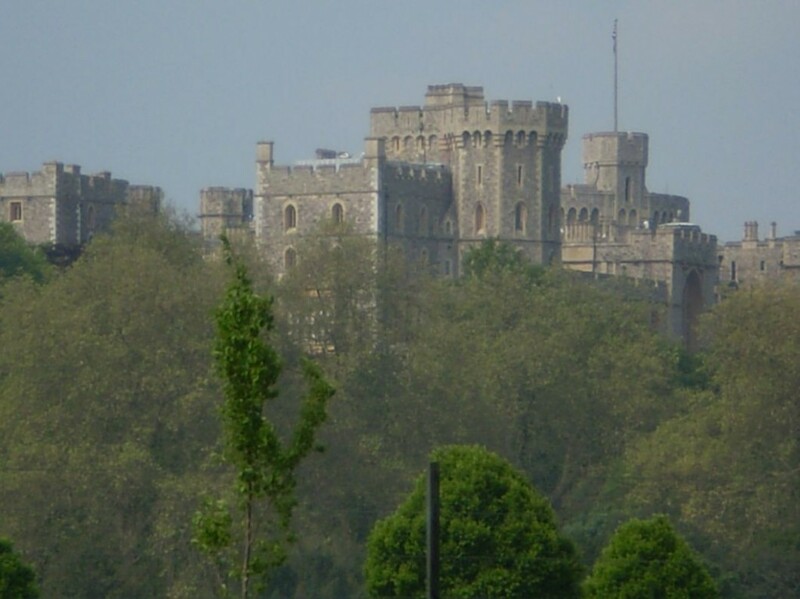 We crossed back to Windsor to look around the Castle area and stumbled upon a well hidden Waitrose. 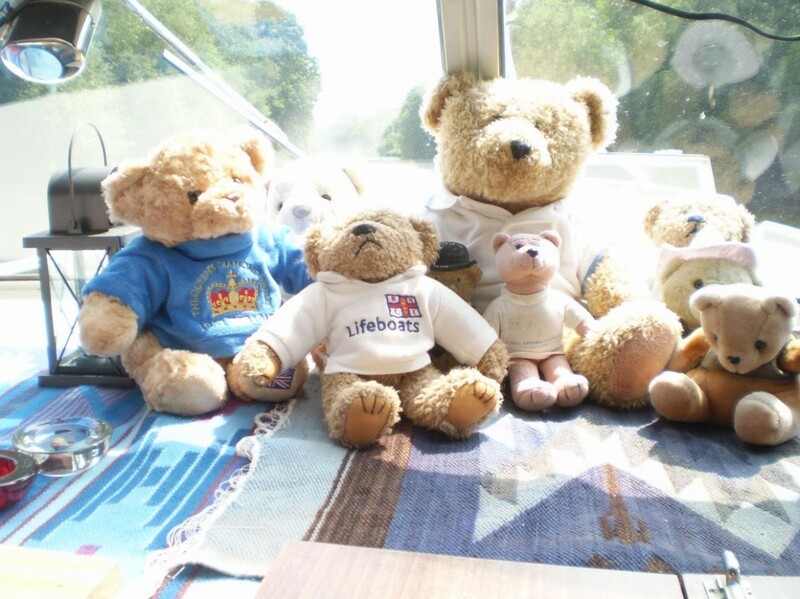 It seemed like miles back to the boat with the heavy shopping so clearly deserving of Pimms 🙂 We also had time to go aboard Libertijn for a quick catch up with the crew. Currently there are several pale green double skulled boats rowing up and down past us, with several tourist trip boats too and we are just about to light the bbq again. 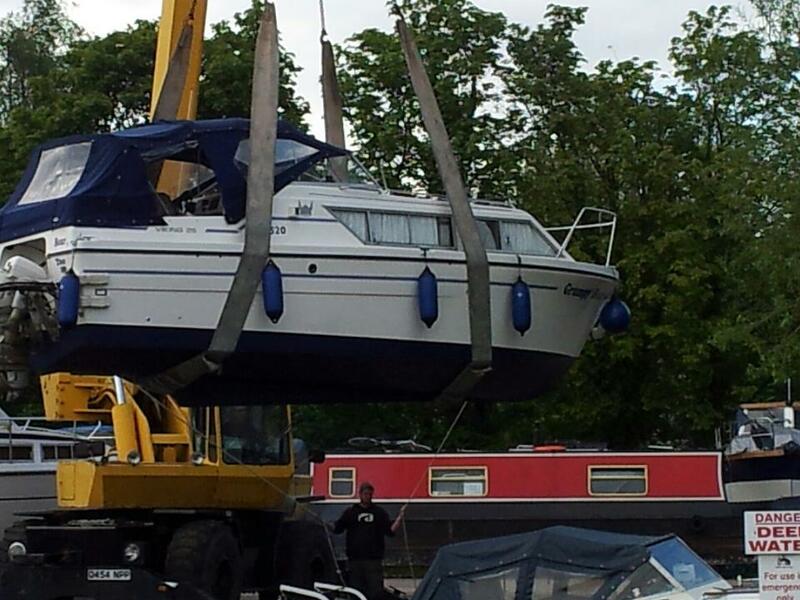 One of the many trip boats - wouldn't want to meet this on a narrow bend! This morning it was a bit cloudy and overcast when we got up; according to the radio flights to Gatwick were being diverted due to fog. A few rowers were out on the river & a motorboat came past with what we assumed was ‘Dad’ giving his daughter a lift to school by river – better than being dropped off in the car – unless it happens to be raining perhaps. 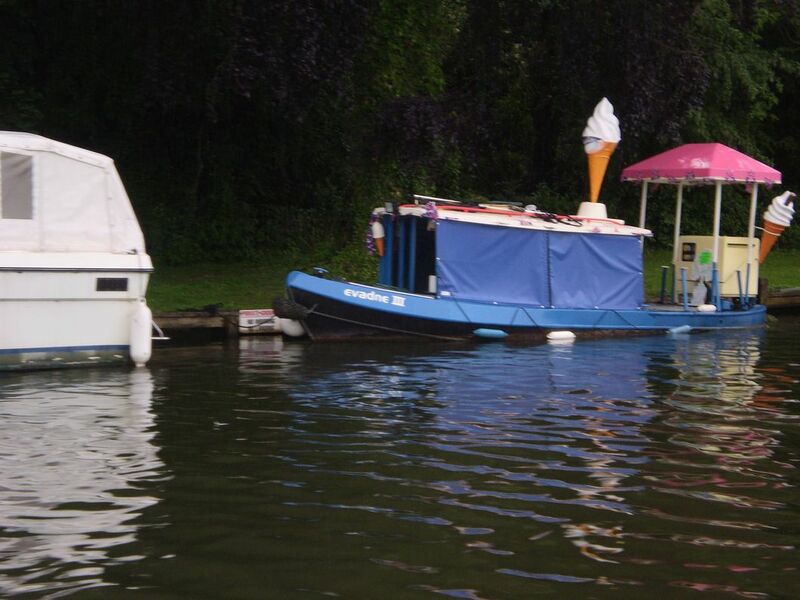 and a few elegant houseboats en route. …before arriving at Teddington just before midday. Since our arrival we have lunched and shopped in Teddington, done our accreditation & received our pageant wristbands. 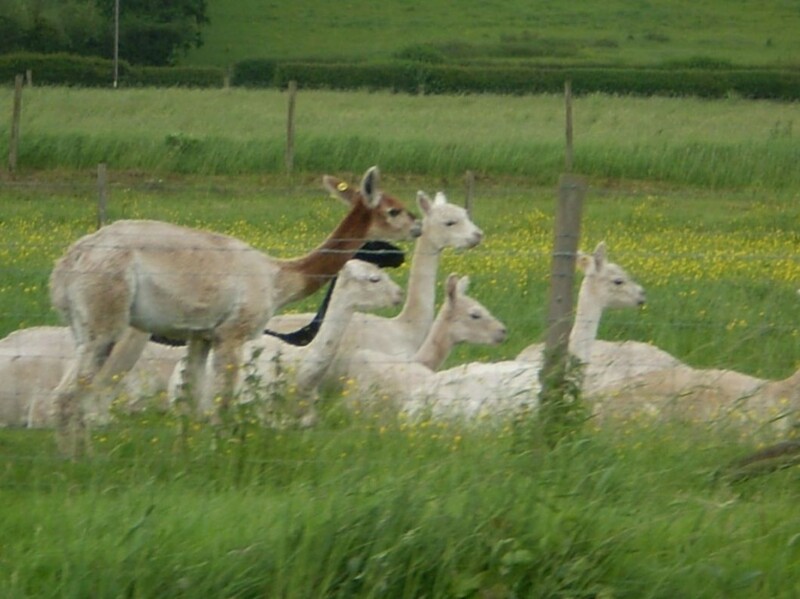 It seems a bit like going to a music festival wearing these – possibly more like Cropredy than Glastonbury. Whilst I have been updating the blog Mike has been busy completing boaty jobs. 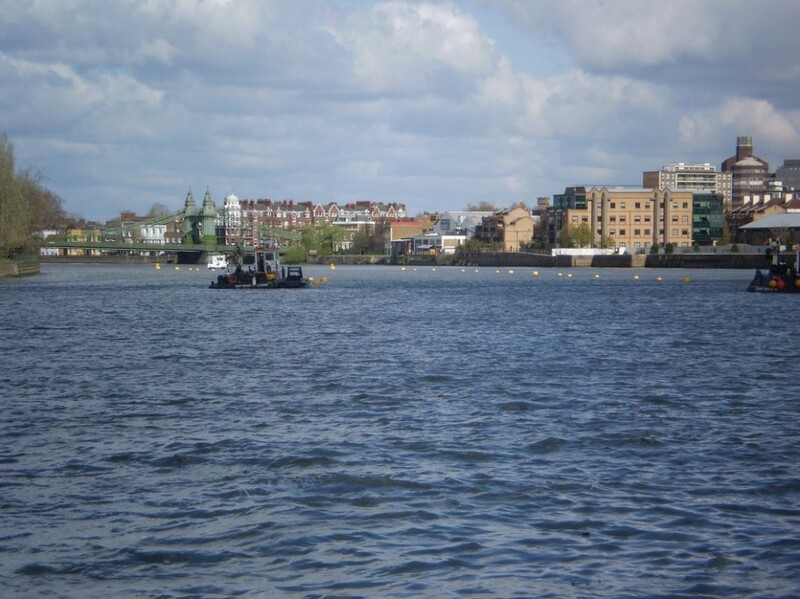 He’s secured the throwing line and lifebuoy on deck, attached longer bow and stern lines and checked the anchor chain & rope – all items that we need for additional safety on the tidal Thames. The final preparation has also been done for the mast to secure the Jubilee bunting – Sunday here we come. 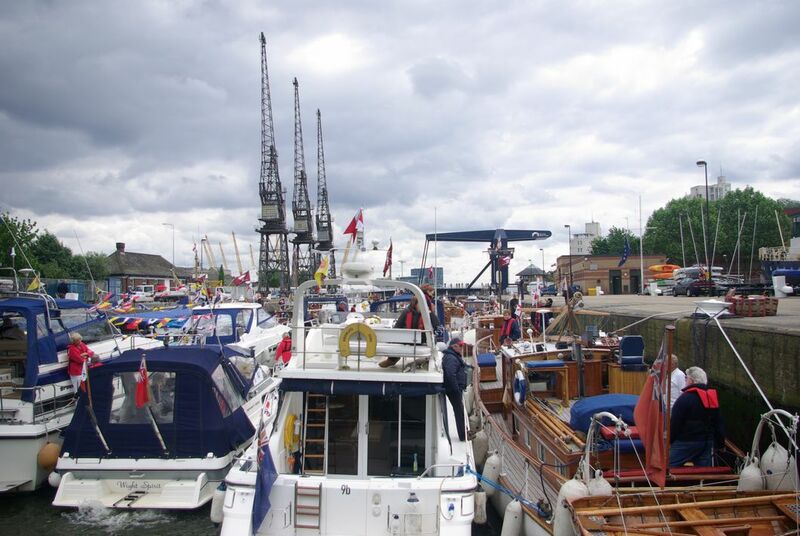 We survived our passage through London yesterday on the Tidal Thames and are safely moored in West India Dock. 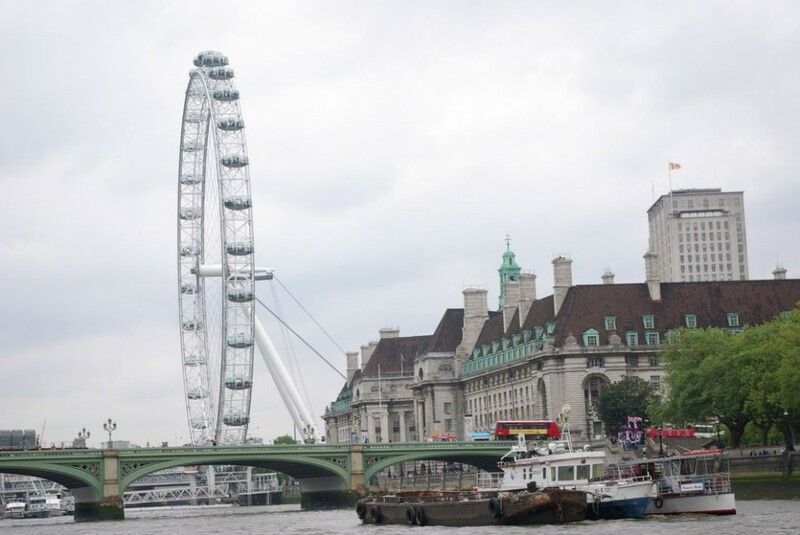 …….and the London Eye in our little boat! 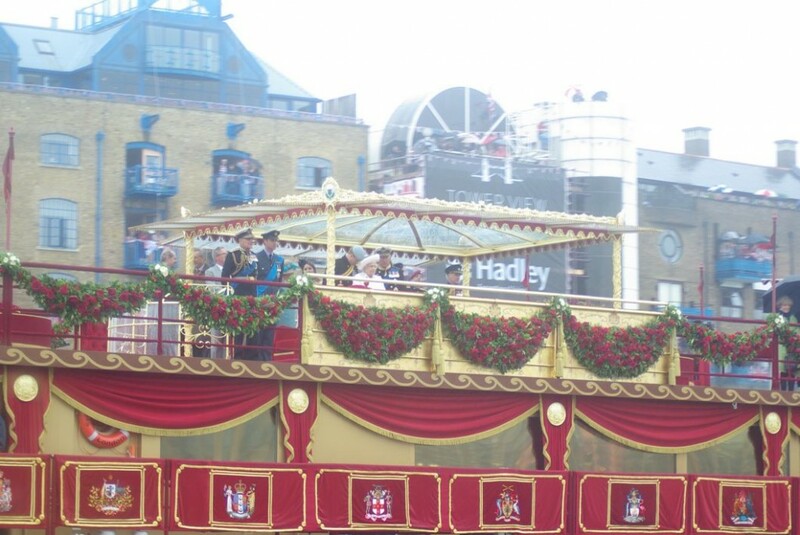 as well as going under Tower Bridge before entering West India Dock opposite the O2 Arena (the Millenium Dome). We made very good time down river so had to “hover” in the tidal river for half an hour until we could “lock in”. Mostly the passage was very pleasant but we did get rocked a few times by the wake from very large boats. Poor Grumpy wondered what was happening and the teddies went flying on one occasion. 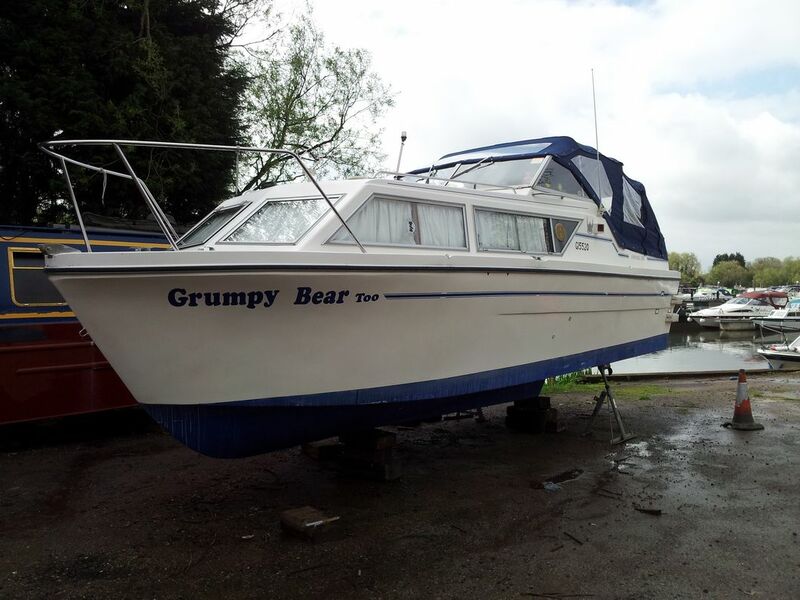 Grumpy Bears have difficulty with their sea legs! 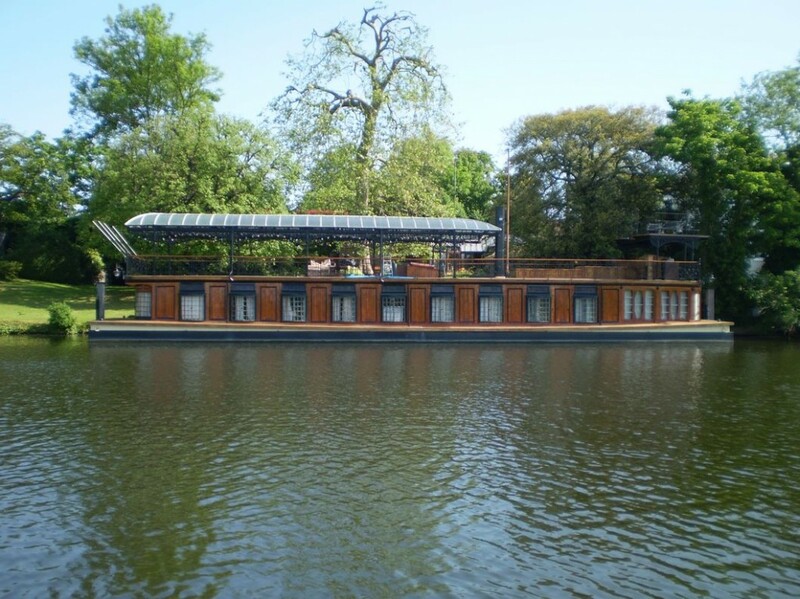 As we passed Brentford we managed to do a quick photo shoot with Scholar Gypsy, a narrow boat owned by a fellow GOBA member and also in the pageant. Hope the photo boat got some good shots of us both on the tideway. 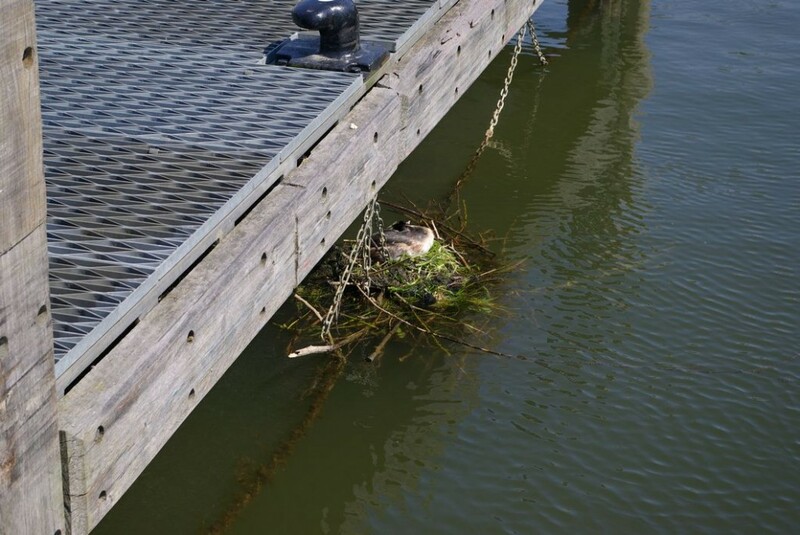 There is so much going on that this is a quick update post – we will get photos on tomorrow when we are moored overnight on our mustering moorings. We have successfully passed the inspections by the MCA so have our pageant ID numbers and are “good to go”. New crew member now onboard Grumpy Bear. After a long day at work I jumped on a train from Derby and arrived at South Quays Docklands Light Railway Station at nearly midnight in the rain. Although my cabin bunk was very cosy I was not there for long as we had a 5.30am alarm call so that I could get my River Pageant Accreditation wristband before we set off for the lock at 7am. Once through the lock with 57 other recreational motorboats we began our journey upstream with the tide through central London towards Hammersmith. 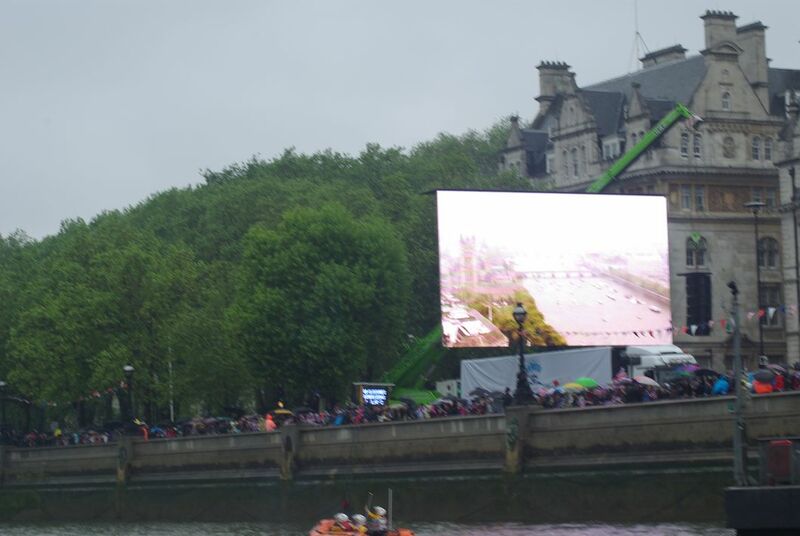 Despite the early hour there were already spectators out on balconies either waving flags or taking pictures of the flotilla. 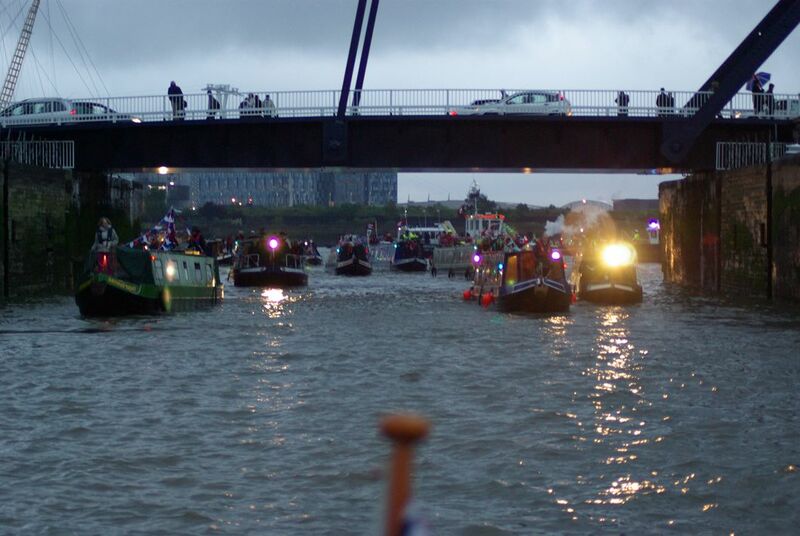 We passed many moored boats that will be taking part tomorrow especially the tall ships. 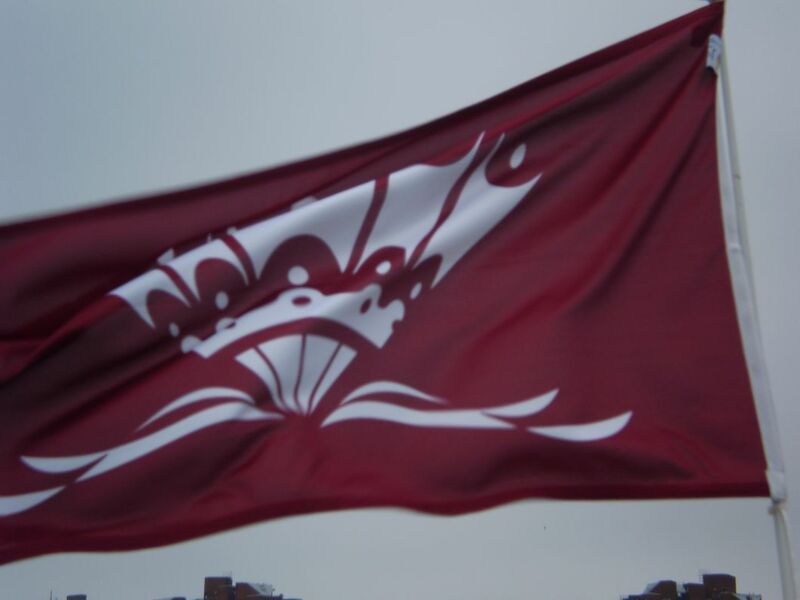 We saw some interesting banners and decorations on buildings along the way….. So, we arrived at Hammersmith at around 10am. 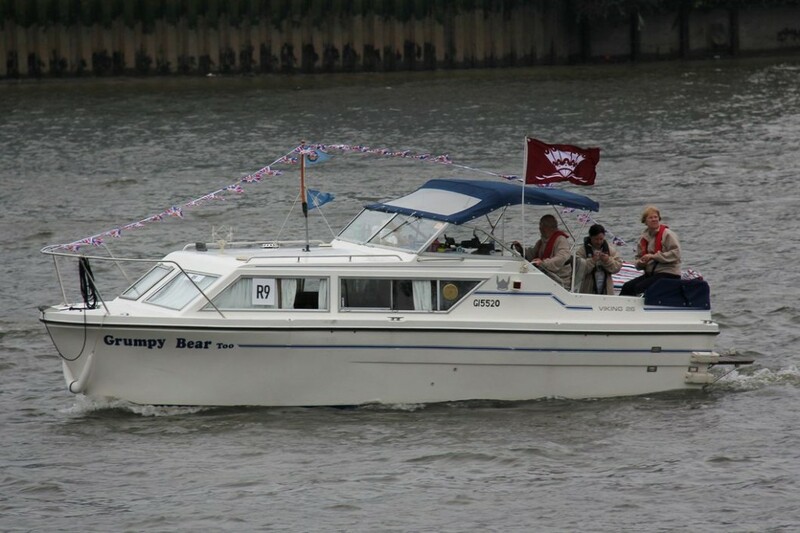 Grumpy Bear is now rafted on a mooring buoy in Barn Elms Reach near Hammersmith Bridge. 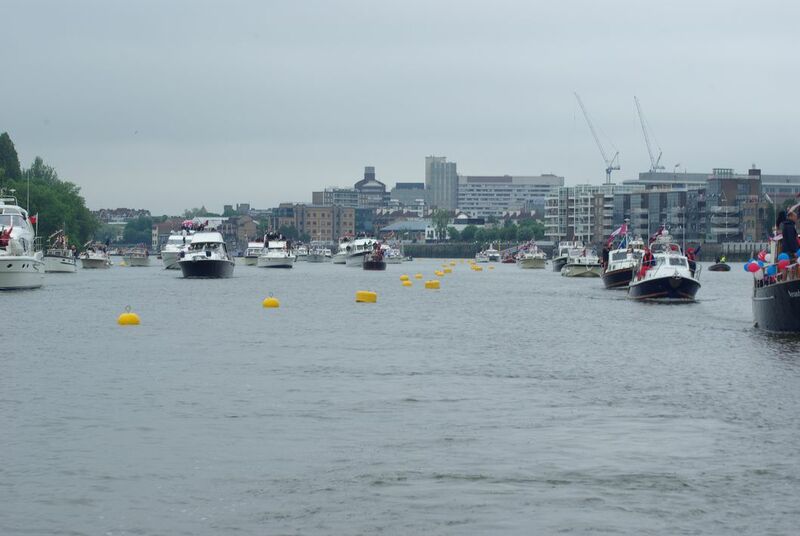 These mooring buoys have been specially laid for the pageant by the Port of London Authority and will be removed afterwards. We will remain here until 2pm tomorrow when we launch back downstream for the parade. We have spent the afternoon lazing about on the river and decorating the boat with Diamond Jubilee bunting. 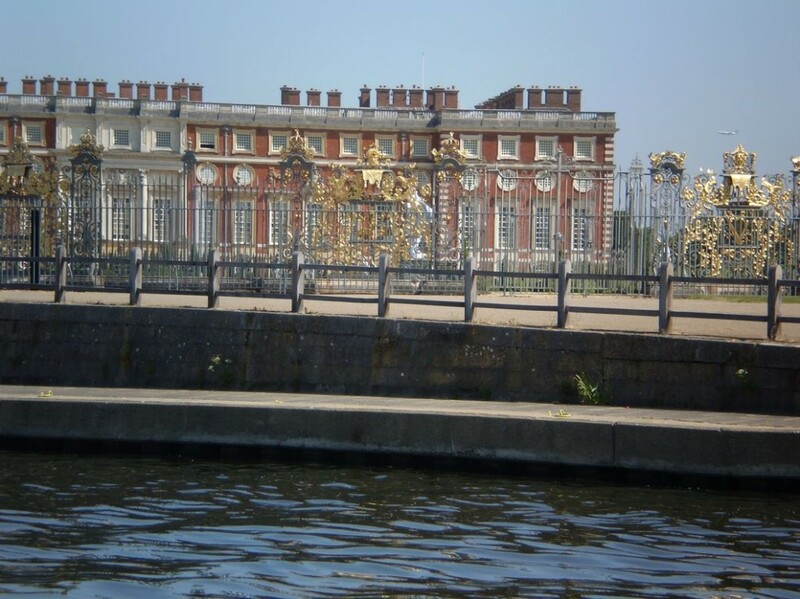 On Monday we had to move the boat from Millwall cut into the main West India dock at 9am then we were able to relax for the day before beginning our journey back up the Thames to Teddington on Tuesday. We took this opportunity to dry out both our wet weather gear & the cockpit of the boat. Plus we were able to explore parts of Canary Wharf and enjoy lunch out with Melanie before she caught the train back to Derby. 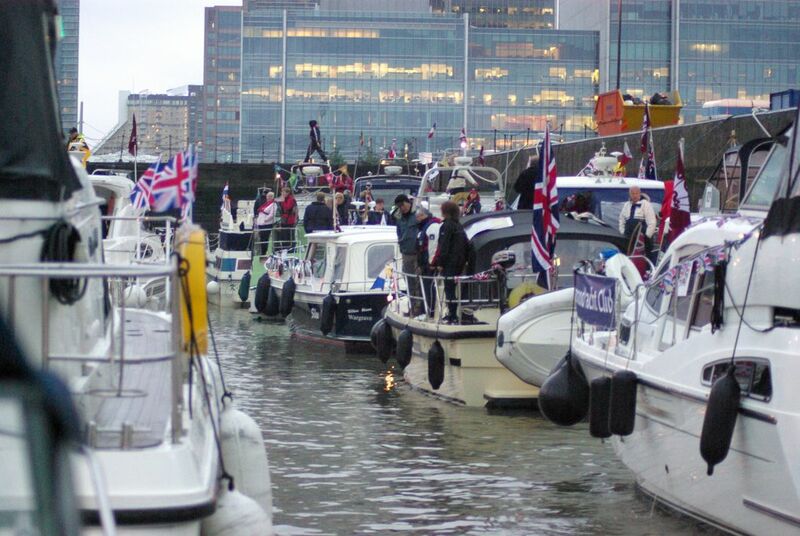 Tuesday morning we all lined up to exit the lock out of West India dock into the Thames at 11am at low tide. 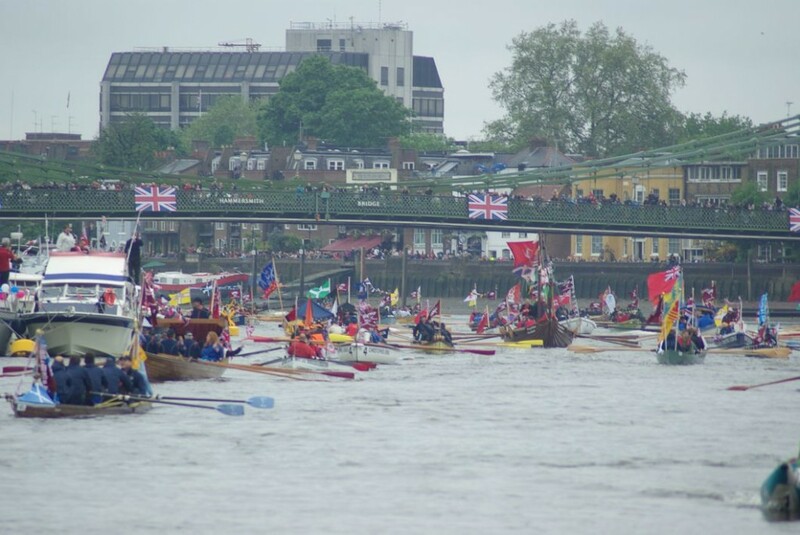 They packed in as many boats as possible, some of whom turned downstream and out through the Barrier whilst we headed upstream with the flood tide through central London for the 4th and last time towards Teddington – the sea lock into the non-tidal Thames. 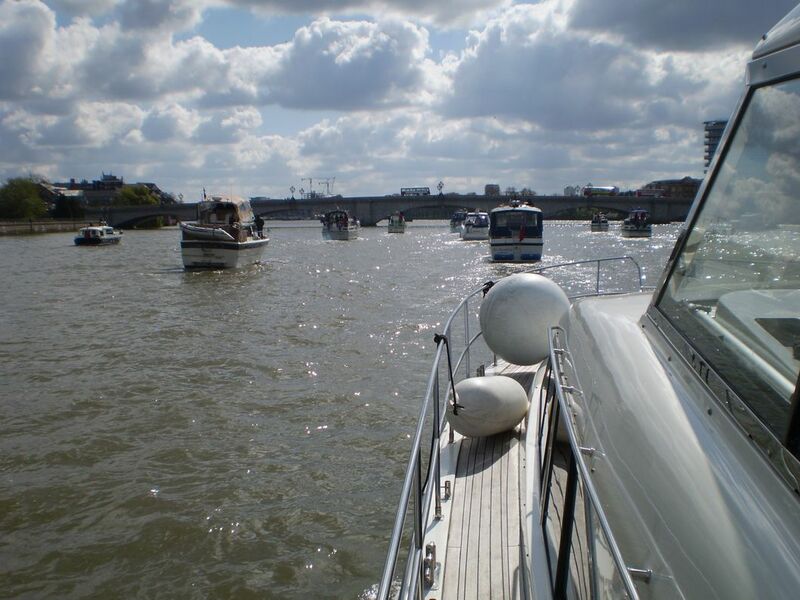 Our final trip through London passed without incident getting us to Teddington in time to join the long queue of boats also making the same passage and now waiting to lock in to the non-tidal river. 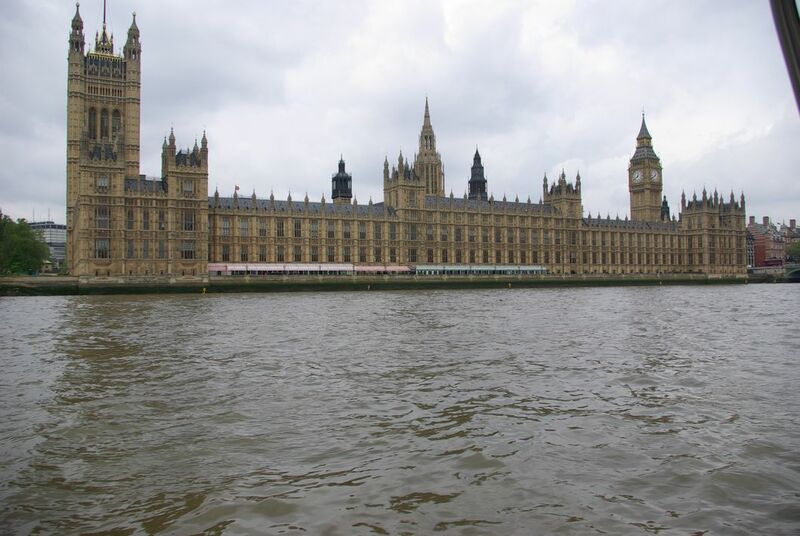 I have to say that throughout our time on the Tidal Thames I was impressed, and pleased, at how our Viking 26 Widebeam cruiser coped with the tidal conditions. Even in quite rough conditions with the wake of passing large vessels she was comfortable with nothing being disturbed in the cabin. The Honda 35HP Engine gave more than sufficient power to drive the boat at a comfortable speed and cope with the cross currents that we occasionally encountered. I would certainly make the trip again given the opportunity. 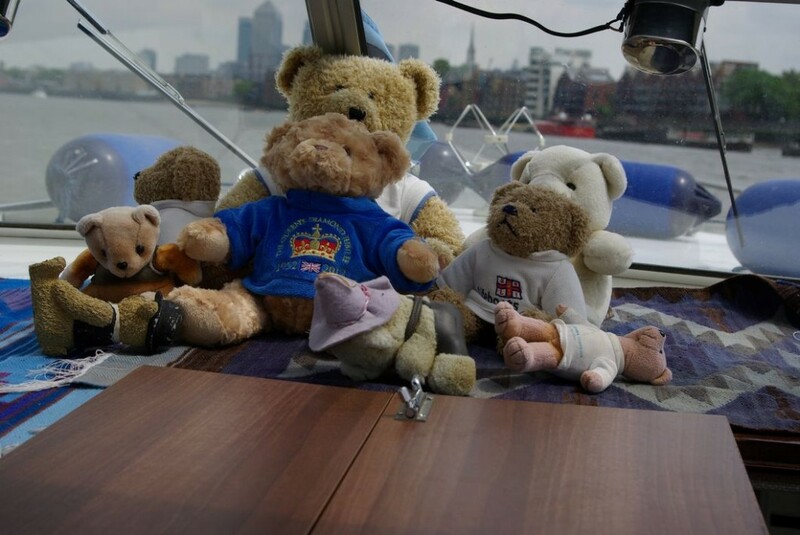 Once at Teddington, we had to sort out our Thames River Licence before starting our return journey to Benson where Grumpy Bear Too would be put on the trailer back to Buckden. We had just 5 days to get back to Benson so the return trip upstream against the flow of the river would not be the gentle 7 day potter downstream that we had at the start of our adventure. So, although it was raining again we headed on and moored up above the recreation ground at Runnymeade and the clouds passed over for a sunny evening. 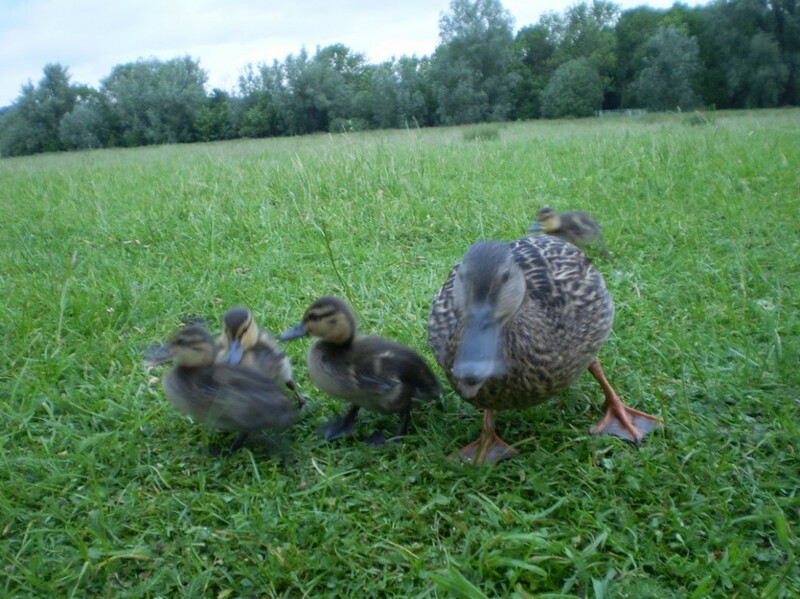 Today we left in sunshine and light cloud but most of the day it has persistently rained on us again. We stopped briefly at Windsor marina for petrol and water, and again at Bray marina for a replacement gas bottle (Windsor was out of gas but phoned ahead to Bray for us so a bottle was ready and waiting) and eventually when we moored between Hurley and Henley at Westfield Farm moorings the rain abated and we had a brief glimpse of sunshine. Definitely not the weather to stop me and buy one! 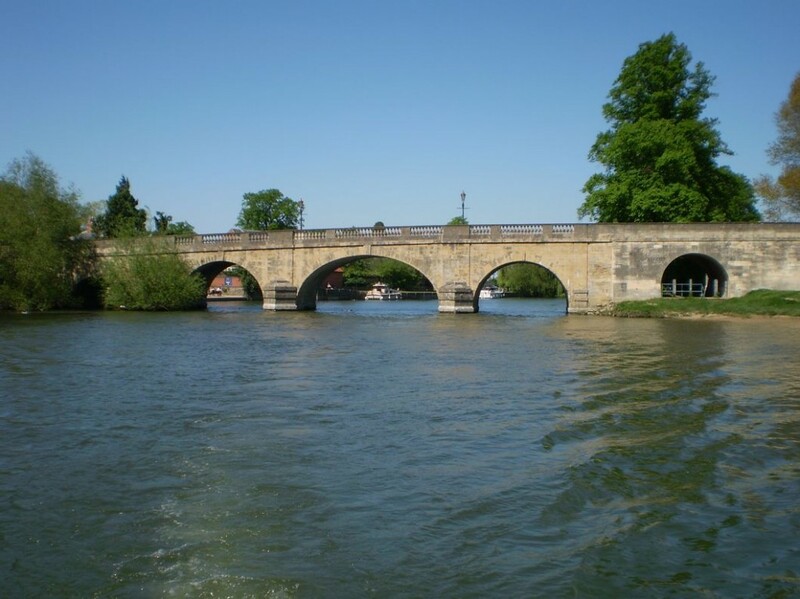 Saturday 9th June – still windy but some sunshine at last so we headed off to Wallingford and managed to moor downstream of the bridge. It was quite shallow along the bank which meant we were the only boat on the mooring; the narrowboats couldn’t moor without going aground. One tried, and got stuck in the mud for a good half hour before getting towed off by another narrowboat – which promptly got stuck after going through the bridge and trying to moor on the right hand side. 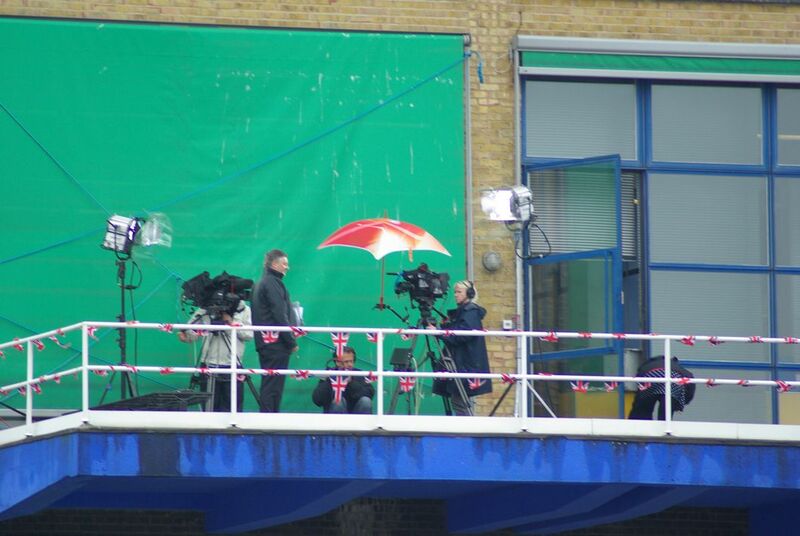 It was there for a long time half blocking the bridge arch. After lunch we explored Wallingford and discovered some geocaches. This involved a fair bit of walking around parts of the town and surrounding countryside that we would not have known existed and at times had some fantastic views of several red kites soaring above the tree tops. I could watch these birds for hours. 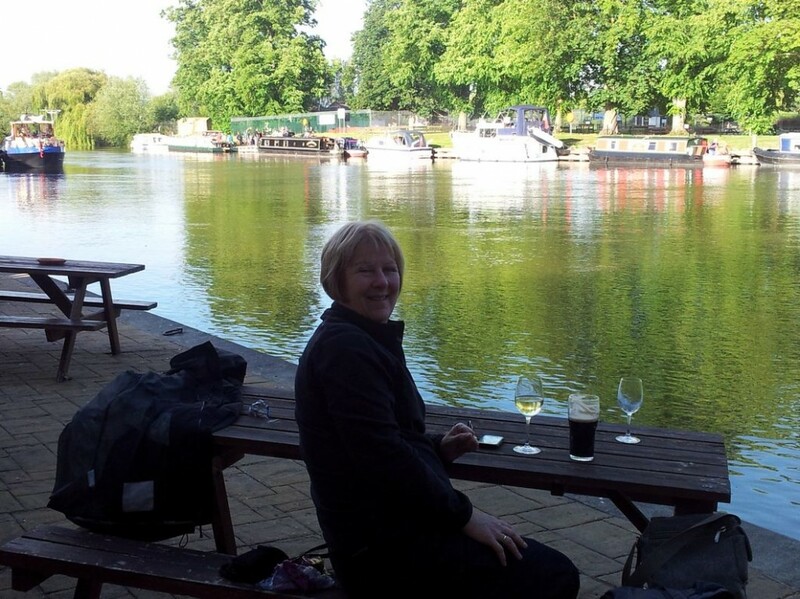 We finished our afternoon’s walk in hot sunshine with a refreshing drink at ‘The Boat House’ – fantastic end to a fantastic holiday experience. 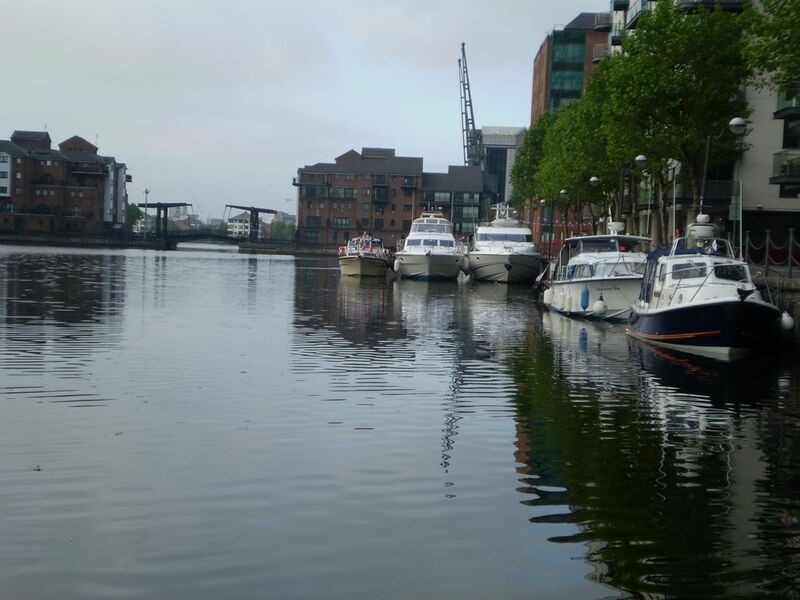 Sunday back through Benson Lock and on to a pontoon at Benson Waterfront. 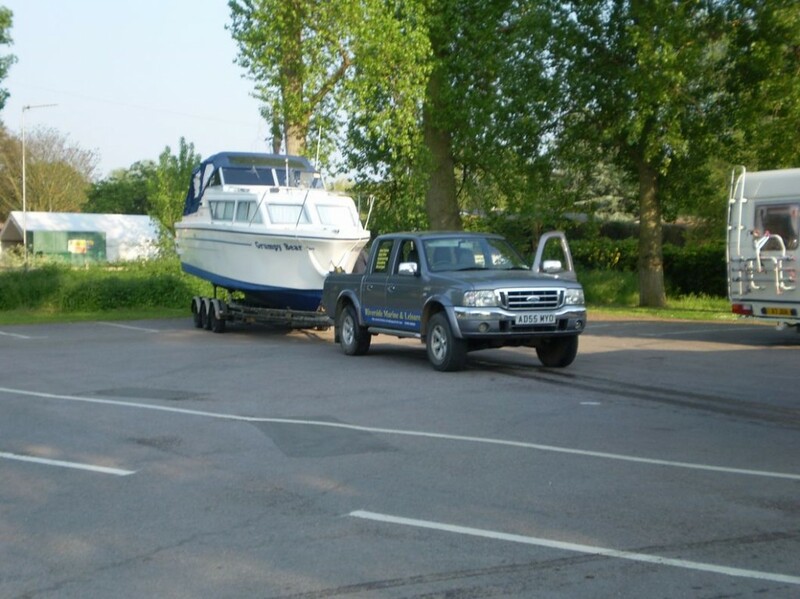 Here we were able to offload our belongings and prepare the boat for road transport back to Cambridgeshire. I have to say that we got great service from the Guys at Benson. 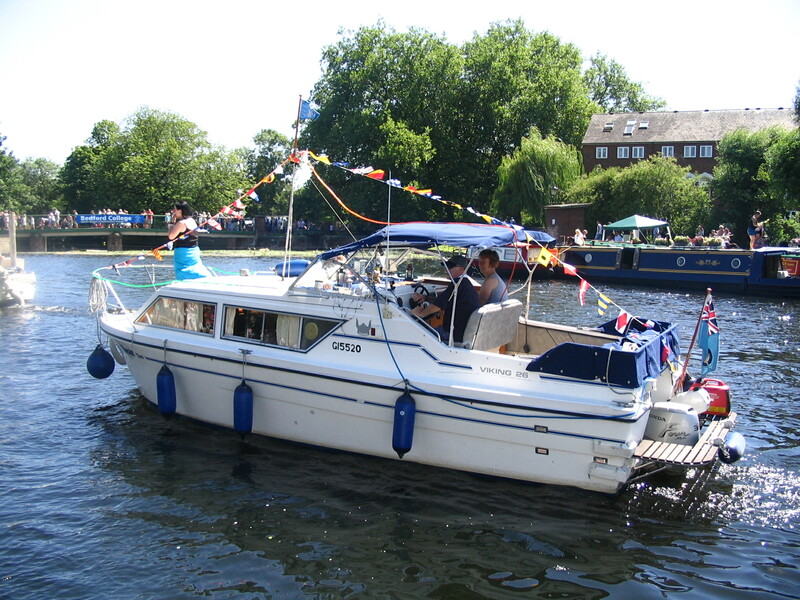 They are incredibly helpful and its a great location to start any trip on the Thames. 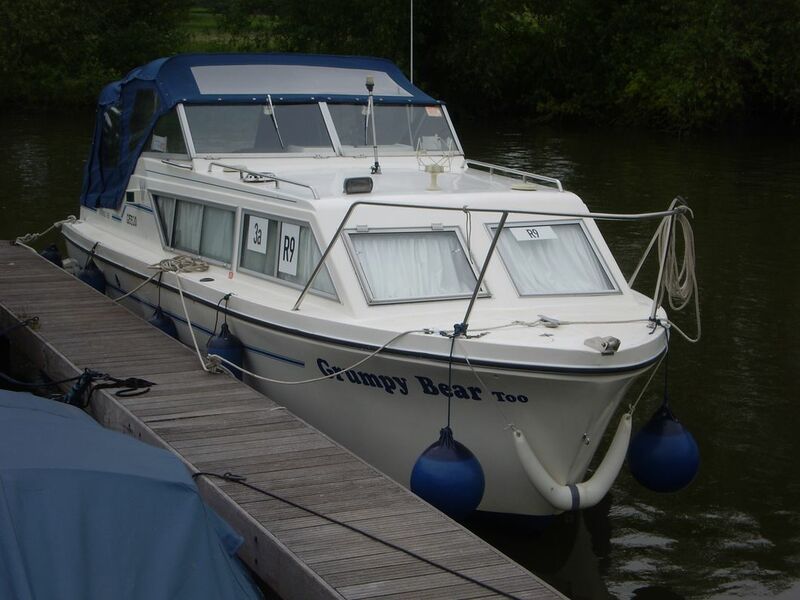 Grumpy Bear Too was safely delivered back to Buckden Marina on Tuesday by Riverside Marine and Leisure. Great service from David once again.